This fellow lives either under or directly adjacent to the deck. When I put out the peanuts yesterday, he/she startled me by dashing away from the deck. I'm not sure if he/she has a nest of sorts between the deck and the air conditioning unit or if he/she actually is under the deck. He/she moved so fast I'm thinking he/she is either tucked up next to the house or the AC unit. He/she just sat there while I took some photos. 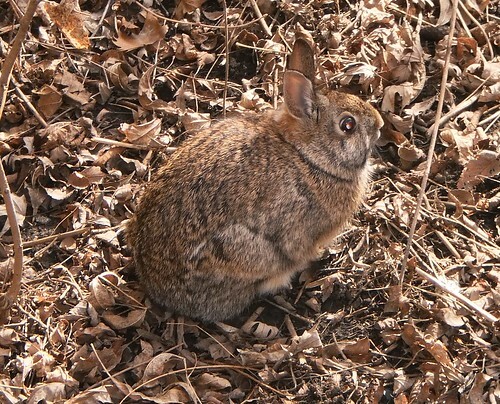 What strikes me about this photo is that it clearly shows the camouflage of the rabbit. If you were giving a leaf strewn area a cursory glance, you probably wouldn't see the it. He/she is rather bold living up against the deck. While the girls aren't outside all that much, they do come out. I'm not sure precisely what they would do if they spotted the bunny. I'm not sure I want to find out either.